Portomaso Oracle Live Blackjack Review - Fabulous Game rules! Double on any hand value. You can Split up to 4 times. 21+3, Perfect Pairs and Bet Behind Side bets. Insurance Pays 2:1, Blackjack 3:2. The Dealer stands on Soft 17’s. I have a bit of an issue with what to call Portomaso Live Blackjack. On one hand the game has been created by Portomaso Gaming. 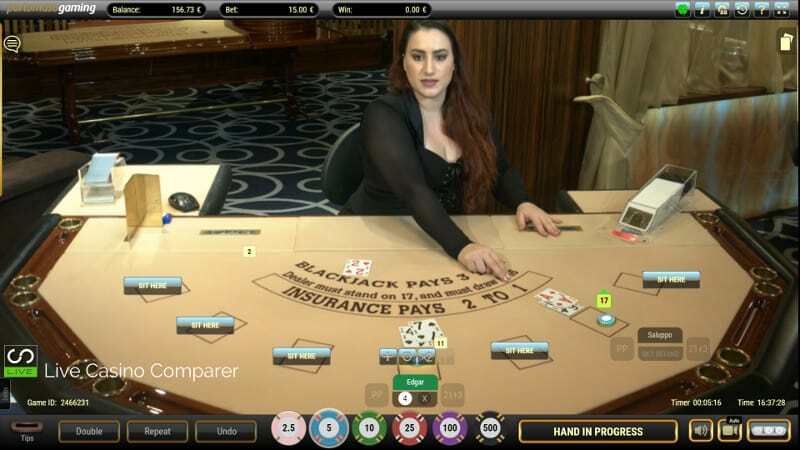 On the other, the tables are located at the Oracle Casino in Malta and on most casino sites the game is listed as either Oracle Live Blackjack or Oracle Lounge Blackjack. For the purpose of this review I’m going to refer to it as Portomaso Oracle Live Blackjack. Is Portomaso Oracle Live Blackjack any good? Oracle Live Blackjack, produced by Portomaso Gaming, is one of those rare casino games that’s very close to being perfect. Portomaso Gaming has remained true to its land based origins. 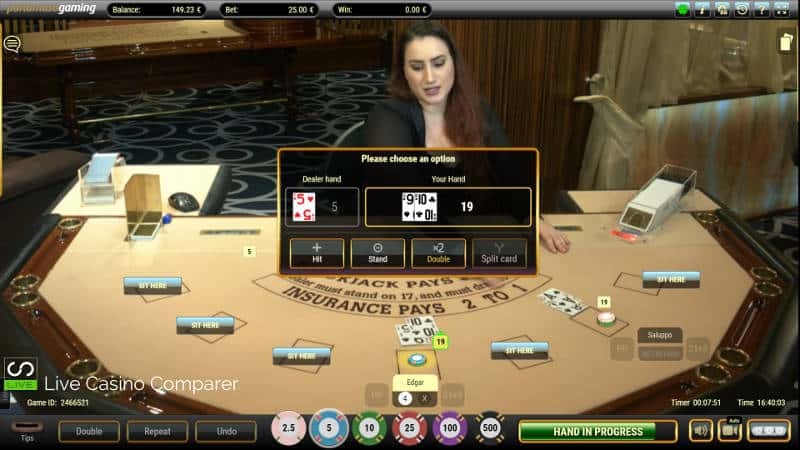 It’s produced an online live dealer blackjack game that is identical to the game you’d play in ones of its land based casinos. In fact the tables are all located in a purpose built studio attached to the land based Oracle Casino in Malta. As the saying goes it’s as real as it gets! What makes Oracle Live Blackjack so special? When I say this is the Perfect game, I mean in terms of the playing rules. On the surface every Blackjack game looks the same. While the objective of Blackjack is to beat the dealer, an experienced player is also looking for ways to increase their initial bet when the rules allow and the odds are stacked more in their favour. Some games have rules that suit and encourage this while others are more restrictive. It’s clear that Portomaso Gaming understands this from their background in land based casinos. They have produced a game with a set of rules that experienced players would say are near to perfect. That’s what makes the Portamaso Live Blackjack something to cherish. Portomaso Live Blackjack is played with 8 decks of 52 playing cards. The cards are manually shuffled and are dealt from a clear Perspex dealing shoe. Shoe penetration is set to 4 decks. After the cutting card is dealt the shoe is replaced with a fresh one filled with 8 decks of cards. The game is played to European Rules, which means the dealer only takes one card during the initial deal and completes his hand after all players have completed their hands. This is significant because the dealer is unable to “peek for blackjack”, which I’ll explain in more detail below. Insurance is offered when the dealer is showing an Ace and this will pays 2:1 if he has a blackjack. Blackjacks are paid at 3:2, which is standard across all online live blackjack games. If you’re dealt a pair your able to split them up to 4 times. 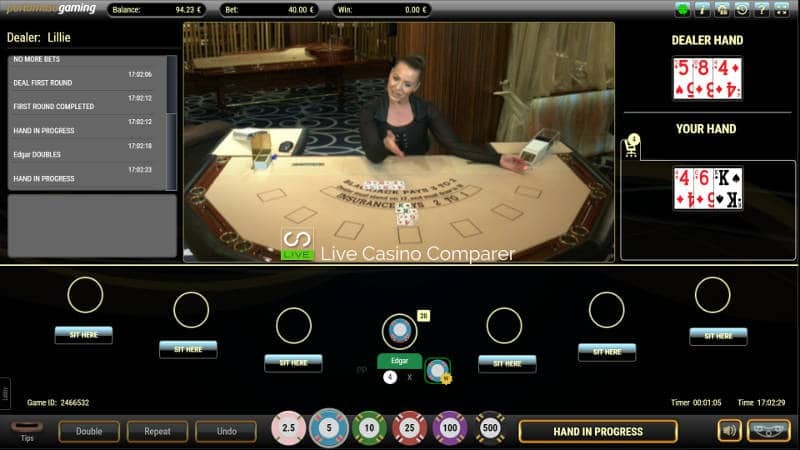 This is a record for any live casino blackjack game and unique to Portomasos Live Blackjack. You’re able to double your bet on any hand value and also on Split hands. Again this is rare and only a few providers allow this. Split Aces only get one card. If it happens to be a ten the hand counts as 21 not a Blackjack. Blackjack side bets can be played alongside the main hand. There’s perfect Pairs and 21+3. Bet behind is available for seated and non-seated players. Seated players are able to configure how their Bet Behind hands should be played when splits and doubles occur. All other actions follow the decisions of the seated player. Where are the tables located? The tables, currently three are located in a studio area at the Oracle Casino a land based casino owned by Portomaso Gaming in Malta. They’ve also got a range of Live roulette and Live Baccarat tables. What’s the playing interface like? As playing interfaces go this seems to include all the best bits from the other casino providers. The one thing I don’t like is the Pre-Decision toolbar that comes up after your cards are dealt. It’s not defined by colour, so it’s very easy to miss or make a mistake. Betting Options – These are laid out clearly along the bottom of the screen. Large chips with a good disbursement of denominations on them make it easy to select your bet amount without having to place too many chips. The standard repeat, double and undo buttons are clearly marked. For Dealer chat there is a box which also displays a record of your playing actions. Video quality is controlled automatically, but you can override it if you’re confident that your connection is always going to be good. There are two viewing modes, 2d and 3d. Full screen(3d) is as the name suggests, it’s you, the table and the dealer. Mixed screen mode (2d) has the dealer and table inset into a computer generated image of the table. This gives a clearer view of the other cards that are dealt and has the chat window open all the time. This mode is automatically selected if your connection is poor. It’s all down to personal preference as to what you use as a default. For me, I prefer Full Screen mode. In play decisions are presented either as a toolbar, so you can select your next action before play gets to you or as a box in the middle of the screen. The latter contains details of yours and the dealers hand and your options of Hit, Stand, Split and Double. The three side bets, 21+3, Perfect Pairs and Bet Behind are the same as those found at other live casino providers. The payouts follow general standards except the payout for a Flush in the 21+3, which is 5 points lower than elsewhere. 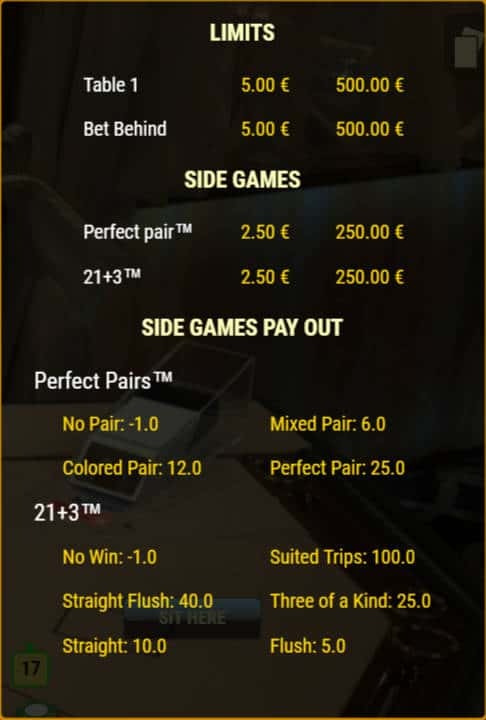 You can compare blackjack side bet payouts here. When betting Behind as a seated player you can choose how you want to act by changing some of the configuration options, as shown in the diagram. 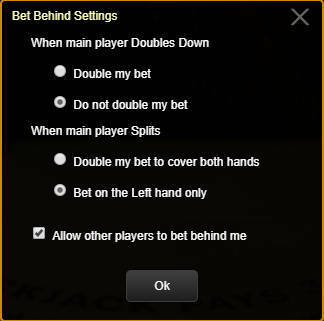 You can also decide if you want to allow other players to bet behind you. I admit I’m a fan, even though this version of Blackjack is played to European Rules. I love the fact you can double on a split and split up to 4 times. Watch my video to see it happen in real time. I’m disappointed that I personally can’t play at Portomaso casinos due to licensing restrictions as there is no UK License. I’m assured it’s on it’s way! Until then I’ll have to remain a bit jealous and play at other live casinos listed on this site.